When we think about drone footage - particularly from the very popular DJI Phantom - we often envision wide-angle or even a fish-eye look that is far from being cinematic or filmic. The big advantage of drones (UAVs, multicopters or whatever you want to call them) is their size, which allows filmmakers to get shots that would be impossible with full-sized helicopters. Especially with close proximity flying, wide angle lenses (16-24mm) can achieve a really interesting look that amplifies speed and proximity. With the latest technology of octocopters that are getting stronger and can lift higher payloads and more importantly the stabilization reaching a new level of perfection with the Freefly MōVI M10 and M15, we are no longer bound to only using those wide angle lenses. Brooklyn Aerials has been filming with longer focal lengths for a while now. Take for example, an Under Armour commercial that we shot in the summer of 2014, where we got some amazing tracking shots with 85mm and 100mm Ultra Primes on the RED Epic of a marathon runner, running through the desert in New Mexico. 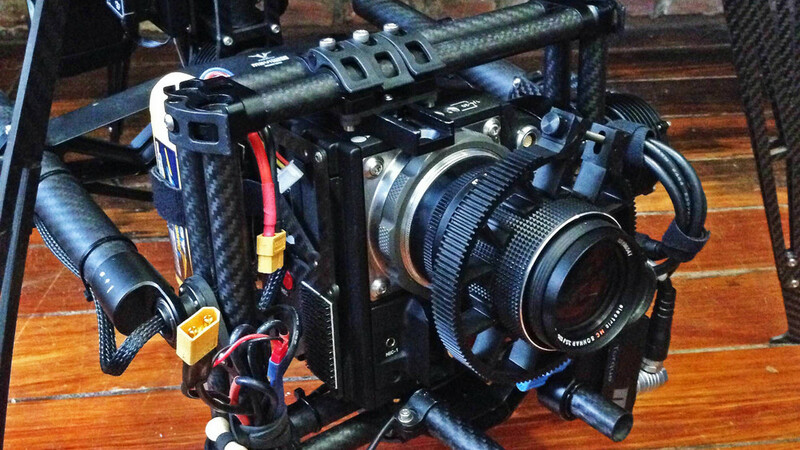 In a recent test we flew our RED Epic Dragon with a vintage Zeiss 135mm lens - a 170mm equivalent on 35mm sensors. On the MoVI M10 with full cage upgrade. Camera and remote focus are powered off a lipo. While on a wide-angle, even a 35mm lens focus isn't as critical (close to infinity even at f/4 works for nearly every shot) - on any longer focal length you most definitely need a remote follow focus system, which adds more weight to the rig and adds the complication of having the camera operator try to pull focus and work on the framing simultaneously or requires an additional person that keeps things in focus (or out of focus). Pulling accurate focus also means that you will need a reliable, latency free, long range HD video downlink - a 5.8gHz SD signal that works great for wide-angle applications just won't cut it. The TERADEK Bolt 2000 is probably the most reliable solution. Long lenses are great for detail shots, scenes with lots of foreground and mediums. Especially slowly rotating around the subject will give an eerie and extreme look, as the background will move at a rapid speed. You'll also quickly realize that certain shots won't work or won't look as good as you might envision. In particular, wide shots with a very long lens just look like stationary full-sized helicopter shots and have a distinct newsy feel to them. If you use it right you will be able to get shots that won't instantly give away that you are using a drone (which is a good thing). It opens up a tremendous amount of options to use the technology for better storytelling and really takes drone-cinematography to the next level, as the UAV becomes the tool to move the camera in a very controlled and original fashion and less so to achieve the over-done "drone effect".